Since no one, excluding amateur / professional photographers, carries around a bonna fide, unitasker (thanks Alton) camera these days, the performance of a cell phone camera is a seriously important factor when considering which little piece of tech to call your own. The camera on the S4 was really nice, that’s for sure. 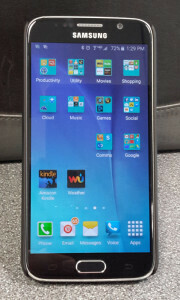 However, they really kicked it up a notch or seven for the S6. While the 13 megapixel camera on the S4 was no slouch by any means, they bumped up the resolution on the S6 camera to 16 megapixels. Not a huge difference, but a little added clarity to photos for sure. Where the S6 really starts to pull ahead is the little extras they added to help you capture better photos. It’s auto-focus tracks a hell of a lot faster, so you’re less likely to miss that perfect moment because your phone was still trying to focus. If you’re taking a picture of something distant, the S6 has an 8x zoom compared to the S4’s 4x zoom. It also has a larger aperture, which makes the camera perform better in low-light settings. (And lets face it, to a smartphone camera, anything not in direct sunlight is pretty much considered low-light.) And to top it off, there is an infrared light sensor that helps the camera detect light levels accurately. Okay, lets get the largest difference out of the way here. The S6 isn’t designed to be opened. You cannot change / remove the battery. While this may seem like a big deal, when is the last time you actually replaced the battery on a cell phone? And as for removing the battery to reset the phone, all you have to do is hold the POWER and VOL DOWN buttons simultaneously for about 10 seconds and the unit will power off. This is a separate bit of hardware that watches for this action, so it will even function if the processor of the phone is locked or otherwise occupied with it’s own thoughts. Now that I’ve been using the S6 for a few weeks now, I can safely say that the battery life is very good! I use my phone sporadically throughout the day and by the end of the night when I’m setting it to charge, it’s usually still at better than 50% capacity. Now bear in mind, that I use WiFi at work and home, so that helps offload some battery usage. I also don’t spend my day staring at Facebook like a fiend, so that helps too! I do, however, use the Kindle app to read while I’m out to lunch. I use the camera frequently. I have Dropbox getting copies of everything I snap. Bottom line is, the battery of a new S6 far outperforms the battery of my S4 after a year and a half of constant use. “Why of course a new battery is better than your old, worn-out battery! What kind of comparison is that,” you say? Well no one reading this is thinking of buying a brand new S4 with a fresh battery. However, someone reading this is probably holding an S4 that they’ve been very happy with, and they’re trying to decide if it’s worth forking over some cash for a new S6. So that’s why that’s relevant! 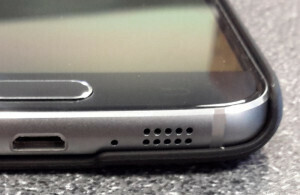 So one point where the S4 severely lacked was the speakerphone / external audio speaker. It was in a stupid place that was easily covered if it were lying on a table, and even when unobstructed, it sounded terrible. They fixed that on the S6. The speaker is at the bottom edge of the phone where it’s unlikely to be obstructed unless it’s in your pocket. It’s a hell of a lot louder, thanks to some effort put into acoustical engineering and resonance. Compared to the S4, this thing gets pretty loud! It’s no Bose L1 pro-audio system, but for a tiny speaker on a phone, it does quite well. I was happy to see the improvement. The display on the S4 and S6 are both stunning. Samsung has some of the best LED displays I’ve ever seen. The S6 is slightly sharper than the S4, but they’re both so good that it’s really not a compelling reason to move up from one to the other. The only area I think they fell down on was the lack of an SD card slot. This, of course, was due to the fact that they designed the phone in such a way that they back isn’t supposed to come off. (I won’t say “can’t come off” because there’s always a way. It just won’t go back on again without duct tape and aluminum bailing wire.) Samsung was competing with Apple on the design factor here, and so like Apple, they didn’t allow you to remove the battery or add an SD card. Not a winning design feature in my book, but it’s relatively minor for me. The smallest memory available on one is 32GB, which will do me just fine. I just need to remember to keep my pictures and videos cleared out after Dropbox has them! If you have an S4 and you’re happy with it – you can probably squeeze a little more life out of it before the battery is totally worthless. They are still excellent phones. However if you’re a mobile gadget geek such as myself, go for the upgrade. While the S4 is still a great mobile device, it’s probably starting to show some signs of wear on the battery. A fresh battery, improved camera, better sound and slightly nicer display are all enough reasons for me to make the switch. 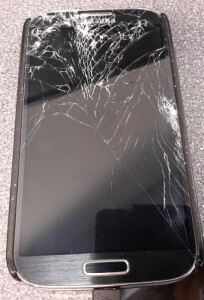 Of course, the fact that I dropped my S4 and destroyed it was also a main factor in my decision! This entry was posted in Science and Technology and tagged battery, broken phone, camera, comparison, Galaxy, mobile, reset, S4, S6, Samsung, SD card, smart phone, speaker by Dave Isom. Bookmark the permalink.